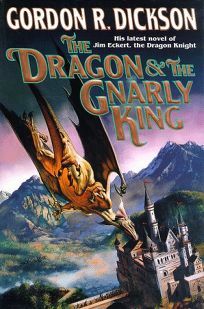 After taking a fling at heroic fantasy with The Dragon and the George (1976) and winning the World Fantasy Award for the effort, veteran SF author Dickson waited nearly two decades to fire his next shot at fantasy with The Dragon Knight (1990). His latest novel in the saga of Jim Eckert, an unassuming young mathematician who travels to an alternate 14th-century England where courage and loyalty are esteemed, plays down Sir Jim's ability to shape-shift into the intellectually challenged dragon Gorbach. Instead, Dickson sends Jim and his now familiarly Tolkienesque companions into the murky territory of Lyonesse to recover Jim's adopted infant, Robert, who was kidnapped by the horrid subterranean Gnarlies. Dickson builds his charming quest tale on traditional morals: friends (like brave Sir Brian, Master Archer Dafydd and the handsomely realized Aargh the Wolf) are necessary for survival; magic, here virtually synonymous with self-knowledge, is a creative art that can't be taught, only learned. Dickson also gently lampoons the heroic fantasy genre by allowing Jim and Angie, Jim's luscious but sensible wife, to express 20th-century opinions about unfair taxes and unsavory politicians in an often hilarious contrast to their medieval surroundings. Good fun is had by all. (Aug.) FYI: Dickson published his first SF novel, Alien from Arcturus, 41 years ago. Since then, he has won two Nebulas and four Hugos.